Our hot-stuff range features a wide-variety of high-quality winter garments, including thermal underwear, and warm winter clothing accessories such as socks, hats and gloves. 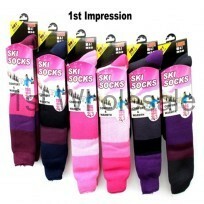 Based in the UK, 1st Impressions are a well-known and respected supplier of wholesale items. Over the past fifty years, we have supplied practical garments such as socks, tights, gloves, hats and thermal underwear to a wide range of businesses. This winter, boost your business’s winter department with an influx of high-quality winter accessories from our exciting range of functional and beautifully designed garments. Featured in our hot stuff co-range is our eye-catching collection of brightly coloured hotsox. Designed for both men and women, our hotsox are cleverly designed to insulate and protect from the cold and have been beautifully created in a wide-range of colours and patterns. From striped pink-and-purple pairs and plain hot-pink warmers to work-inspired yellow-and-black stanley socks in our men’s range, our hotsox range is a unique and bestselling range that is sure to add a touch of colour and functionality to your winter range. 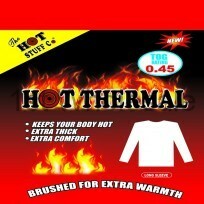 either short-sleeve length or long-sleeve length and are the ideal undergarment for the winter months. 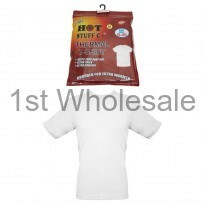 1st Impressions are well-known for providing thermal clothing across the UK, and our thermal vests are guaranteed to be a well-received addition to your winter range. 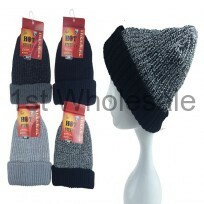 winter and are available in a wide-range of colours from plain black and grey to combinations of grey and black. 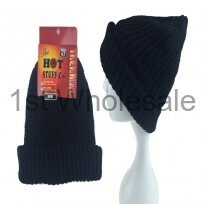 Whatever you’re looking to add to your business’s winter accessory range this year, 1st Impressions hot-stuff co-range is bound to have what you’re looking for.